"It was my mother's fault really..."
"I was in bed with one of those childhood illnesses at the age of eight or so," Pete begins," when my mother brought me a copy of 'Practical Wireless' to read. The stuff I read in that magazine seemed to be more interesting than playing football, keeping mice or tying knots in pieces of string- the usual hobbies of all young men - and I was hooked from then. My uncle - my mum's brother - was very good with radios, and other mechanical and electrical things, and he gave me my first soldering iron and encouraged me a lot - I used to go and stay with him and help him build radios and amplifiers." The hobby of Pete's youth soon turned into the start of a career, again with the helping hand of Mrs. Cornish Senior. "I was boringly keen on maths and physics at school and when it was time to move on my mother found an advert in the paper for apprenticeships with the Ministry of Aviation (a government department) as they were seeking suitable people for training to inspect and evaluate military equipment. I went for the interview and was accepted - there were only 16 places available in the country and I got one of them." Pete's basic training was in workshop technology and here he learned to torture-test equipment to determine it's suitability for field use." We were working in absolutes - firing things from guns and dropping them out of aircraft - it must work when it gets there! On reflection, that's probably why the equipment we make now can survive so well on the road; it's just the way I was trained: we were taught how to make things to those standards so that we could test the products being offered to the forces." At this stage Pete was still unsure as to whether military electronics was to be his career when the genes took over..."I come from a long line of musicians; both performers and technicians; my father ran a dance orchestra and a violin repair shop all his life, his father was a music shop proprietor and piano technician as was his father's father, so I was destined to follow. I have played saxophone in various jazz and funk groups for many years and my current group is 'The Pete Cornish JAZZ FX'- performing Power Jazz®, in addition to our sound studio where we design and build equipment to help musicians with their problems. It seems I was destined to follow in their footsteps." "I discovered to my horror..."
After a period in industry working on, amongst other things, relay design and cigarette making machinery Pete secured a position at 'Sound City' in London's West End as the Service Manager to the group of shops (Sound, Music and Drum City respectively) that were part of the Dallas-Arbiter Group of companies and this was where he started to redefine the use of electronics in music. I discovered to my horror the very low standards of the musical products sold at that time. I was able to improve customer's amps to a higher standard because of my training; making things more secure by tying components down and replacing some of the wiring. I often found that the internal wiring was of poor quality and would break during transit. The inspection, tightening and paint sealing of every screw in an amp became essential although some products did have very high standards of production; for instance the original Hiwatt amps were wired by ladies 'borrowed' from the military spec place next door where they had made in-flight computers and stuff like that. Pete's customers during the 'Sound City' years were then or were destined to become some of the most internationally famous groups whose influence is still felt the world over. They included: Yes, Queen, Pink Floyd, Average White Band, Bay City Rollers, Caravan, Squeeze, Roxy Music, Genesis, Led Zeppelin, Rod Stewart, Moody Blues, Sweet, Elton John, The Kinks, Status Quo, Family, Wishbone Ash, Thin Lizzy, Leo Sayer, Fleetwood Mac, Emerson, Lake and Palmer, Procul Harem, King Crimson, Black Sabbath, etc. etc.I enjoyed repairing and modifying the amps used by the touring musicians based in London and learnt a lot about how to improve reliability, but I found it more exciting to design and build new 'gadgets' that were requested by both the musicians and their technicians. I made all the accessories sold in the shops but the start of the next phase of my life was when Peter Banks of 'Yes' asked me to build him a guitar effect 'Pedal board'. This was to have a Duo Fuzz, a Cry Baby, a Trem Face and a Fender Tone / Volume pedal built in and permanently wired to eliminate the possibility of faulty jack plugs causing intermittent signal. As I knew how to design low noise DC power supplies I built in the various supply voltages required, to eliminate the need for batteries, stabilized them against mains voltage variation and measured the inherent loss caused by loading the passive guitar with all those pedals. I then designed and built in the various pre-amps and isolators to ensure that there was no loss of tone or volume when the pedals were switched off - a common problem even with today's reissues. "When 'Sound City' eventually closed the ensuing panic amongst London's musical fraternity ensured Pete's fairly smooth transition from employee to self-employed status. He opened a shop, fondly remembered by those who dropped in for tea, in London's Covent Garden (38, Long Acre - Studio 1F) and the orders for his custom Pedal board and maintenance work continued to flood in. "The 'King Crimson' boards were amongst the first ones that I made: two for Robert Fripp, two for David Cross and a tiny one for John Wetton. These were the first boards to be photographed - a practice I still carry on - and were the first to feature the 'doughnut rings' that have become something of a Cornish trademark. These rings protect the footswitches that sit proud of the top surface and have given us a huge increase in reliability for this formally easily damaged item. In addition to the photographs I have also kept detailed mechanical and electrical drawings of all boards we have ever built so that if one is damaged or lost it can be reproduced." Another aspect of Pete's work, in fact a cornerstone of all that he does to free musicians from techno-worry, is his dedication to getting each effect to work to it's optimum, thus maximizing the signal and keeping noise to an absolute minimum. "With separate, hooked together, pedals they can not only cause a detrimental loading to the guitar's very weak signal but also react with each other to cause poor frequency response and unpredictable level shifts when combined. I designed various routing options to keep each effect thinking that it's on it's own and thus doesn't interfere with the others in the chain." Having virtually perfected the art of the guitar and bass effects Pedal board Pete found that some new items in the musicians armory of effects were becoming too large to hide in a slim floor mounted board. 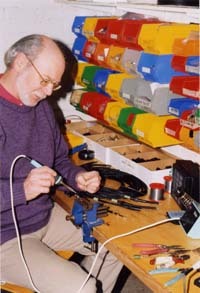 The time was ripe for the introduction of his remote switching system that had taken several years to perfect. 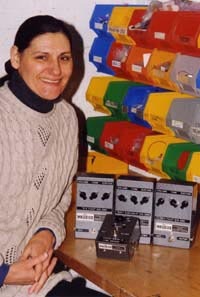 "The introduction of high quality VHF and UHF radio transmitters and receivers was the trigger needed and I redesigned all our audio circuits to allow for not only remote bypassing, muting and amp selection but also to match into the higher signal levels present in rack mounted studio type equipment. The racks could now be off-stage with a single multicore cable linking to a compact remote control footboard with built in sunlight-visible indicator lights and duplicate switching circuits so that the tech can assist in switching if required." "The aspect of our systems that elicits the greatest response is the lack of noise; when they go through our routing units or pedal boards the lack of hiss and hum takes then by surprise - and not a noise gate in sight. It's a difficult thing to explain to our clients because it's almost a negative thing we're doing. We're not producing a distinctive sound - we are freeing them from all the limitations that have previously existed and allowing their tone, which was there in the first place, to be delivered without being degraded or picking up noise." "So you arrive at the sound by taking away the noise?" enquires an innocent guitarist. "NO!" Pete cries emphatically. "That's the basic mistake that people make: we're NOT taking the noise away, we're not letting it get in, in the first place! It's a completely different way of thinking - the noise you hear when you hook up a system is being introduced by the way it's been connected and various other things. We don't allow any noise to get in there, so we don't need to take the noise away with noise gates or whatever. That's the basic philosophy we've worked with over the years, quite independent of any other company - most people just seem to use noise reduction." The Cornish Philosophy As Regards Noise is central to everything the team of Pete and Lynda are involved with: "Lou Reed flew over from Switzerland after hearing of our crusade against noise. He'd been told for twenty years that if he wanted 'that sound' he would have to put up with 'that noise'. Listen to the rack we built for him for the Velvet Underground's reunion (video and album: 'Velvet Redux' on the Warner label) and also his latest album 'Ecstasy', both recorded live and see if there's any noise." Over to Lou, interviewed at the start of the triumphant Velvet's reunion tour in Europe: ' Reed was working with a new toy: a rack system enabling him to switch and combine the sounds coming from his guitar. "It was built over several months last year by a genius in London called Pete Cornish; we call the rack Big Lou. I have pictures of it in my apartment - some people have pictures of their girlfriends, I have pictures of my rack - I wouldn't NOT want to bring that to the Velvet Underground Party." "New gear - new problems"
Given that Pete's client list includes Eric Clapton, Sting, Sir Paul McCartney, Andy Summers, Jimmy Page, Joan Armatrading, David Gilmour, Bryan Adams, Tony Iomi, Brian May, John McLaughlin, Mike Rutherford, Mark Knopfler, and countless other well known names in the Rock Industry, is there anything left to invent or fix on today’s gear strewn stages? "The biggest problem facing today's touring musician, once we've fixed the noise and tone is consistency from day to day. I have collected a huge amount of data about the AC power voltages around the world and have come to the conclusion that the variation in voltage - on stage - is responsible for the variation in tone that players experience from one day to the next. I have designed an Automatic Voltage Stabilizer and Distribution Unit that has proved very successful in preventing the change of supply voltage from affecting the carefully honed tone that the musician has developed. We supplied one of these units to Pink Floyd for 'The Wall' tour and which has been in use ever since." "The other problems that continue to arise are unexpected - when Lou Reed started using an acoustic guitar on stage the problems of feedback under certain unpredictable conditions arose and I was surprised to learn that there was no simple-to-operate unit available that would reduce the gain at those frequencies without interfering with he carefully adjusted tone of his amp. Thus was the FEEDBUCKER® born." "The experience we have gained working with rock musicians from the beginning of effects through the digital rack era is now being applied to today's new, exciting and highly talented bands. The renewed popularity of 'Stomp Boxes' has seen the resurgence of interest in our effects Pedal boards and amp routing units and we have recently supplied equipment to Julian Cope, My Bloody Valentine, Reef, Stereophonic, Don, Subcircus, Kula Shaker, Catatonia, Ash and the Mike Scott Band. Every item of 'Pete Cornish' equipment is individually designed and built to your specific requirements so if the problems with your gear are preventing you from realizing your full potential or frustrating your stage performance we can help you - please contact us for the help you deserve." With sincere thanks to Jordan McLachlan, Tom Mulhern, Danny Eccleston and Giles Smith for their contributions to this brief outline of our work - Pete and Lynda Cornish.